I love neon all year round, but I think it’s just made for summer – especially in pink. Even more so in pink stripes. And this outfit was all about bright colour – neon pink, bright yellow and sky blue – on a column of black and white. I’ve had my eye on these Asos blue mirrored aviators for a while, and I love the happy accident of them matching the blue scarf (a perfect summer cotton scarf, I must say). Accessories… you gotta love ’em, right? Anyone else into their neons big time for the summer at the moment..? J'adore that blazer! Viva la neon! Love all the colors going on here! Fresh and lively. You wear the skinnies well! I love the big mustard yellow purse with the pink/buff stripes. How fun is that. That blazer has me all sorts of jealous. Though it's so humid here, when I head indoors the AC always kills me so havong a layer like that one is perfect. A little shocking pink always makes me smile. 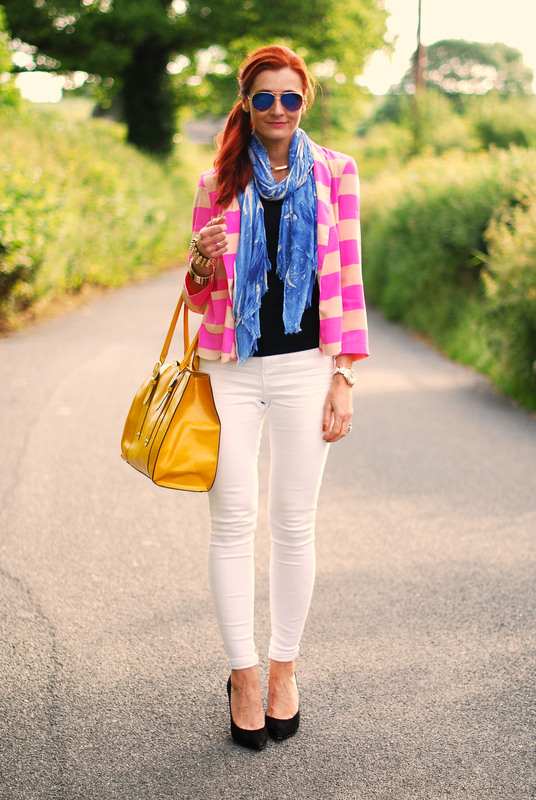 I love how the scarf and the blazer go together. Great pairing. This outfit is killer! I love how all the colors work together. 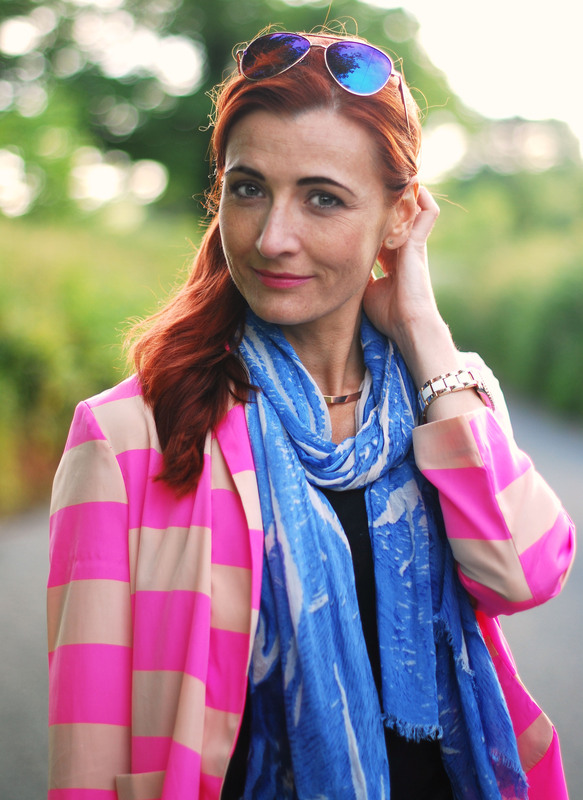 Hmm I always forget this blazer has the scalloped hem… adds that extra something, doesn't it! Thanks Jenn! This is just the perfect amount of neon, imho – you are looking delicious! I loooove this outfit Catherine! your sunglasses are so cool & that arm candy!!! I love neon too, but agree that it really feels like summer. This is a great look! I can't take my eyes off the bag…want it! You look great as always!! Thanks, D – I love the aviators too! You are always a master, dear Catherine.